It goes without saying that the facades of a building are exposed to the negative effects of various environmental and weather conditions like dirt, dust, grime, rain and pollution, just to mention a few. Not only do these factors decrease the quality and value of the building but also, shorten the life of the building. For that reason, regular cleaning and maintenance is much more than a mere obligation as it increases the longevity of the building material along with maintaining the value of the property. Above all, a clean, clear and shining facade improves the overall looks and appearance of the building and leaves a long lasting impression on the clients and visitors. However, it is also a reality that cleaning the facades manually is highly time consuming. Besides that, as an owner, everyone is concerned about the overall costs when it comes to facade cleaning. It mainly depends on several factors like the characteristics of the facade, total area, labour costs and interval between cleaning etc. As mentioned above, traditional facade cleaning techniques are neither a practical nor a feasible solution in the modern times. 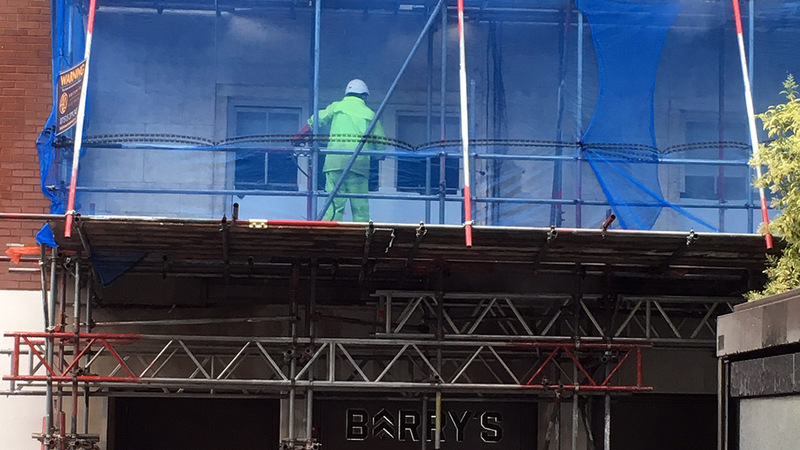 And for obvious reasons, new methods have evolved to meet the evolving demands of facade cleaning and today, these innovative techniques are widely followed by the professionals and the major ones are steam cleaning and soda blasting techniques. They are basically a low pressure cleaning method which involves water and a gentle abrasive. 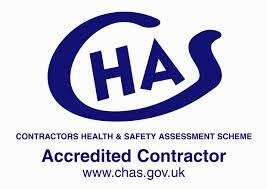 It contains no toxic chemicals; they cause no damage to the stonework, bricks or mortar and are safe for the professionals and the environment. Professionals make a site visit and thoroughly examine the facade to choose the best techniques for your building. 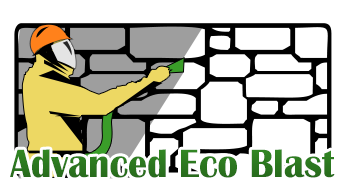 Soda Blasting can be defined as a type of cleaning that incorporates specially formulated fine media mix made of eco friendly natural elements along with compressed air in controlled amounts to eradicate the effects of pollution as well as coatings and residues from virtually any surface without damaging the building. 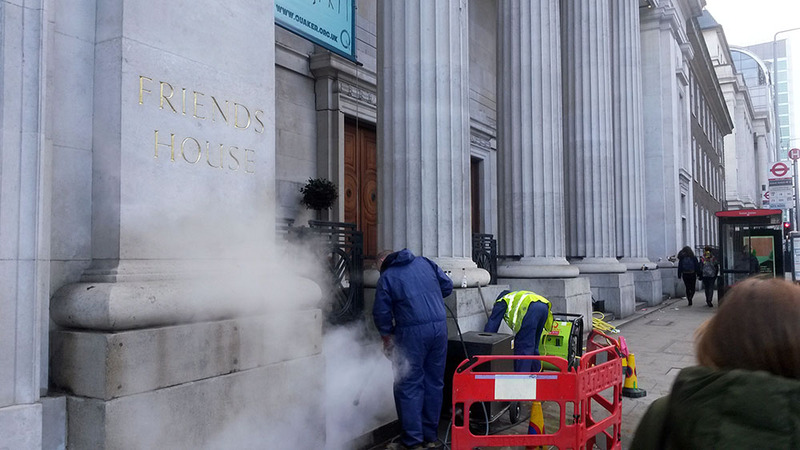 It is a revolutionary low pressure cleaning technique that can effectively and promptly restore the facade of a building to its original lustre without using harmful chemicals or having any risk of damage. The technique is handy and provides a great blast cleaning finish. It can be used for any kinds of surfaces including steel, bricks, stones, wood, concrete, terracotta and all sorts of metal. Plus, this technique is extremely versatile and works effectively on both wet and dry surfaces and can be used against virtually any substance such as graffiti paint, rust, smoke, ash, algae and moss and so on. When it comes to eradicating oil-based contamination and other hash substances, high temperature low pressure steam cleaning techniques are the most preferred ones. State-of-the-art equipment and proven methodologies are used in the process that create hot, pressurized water and accelerate it through a blast hose at a very high speed. 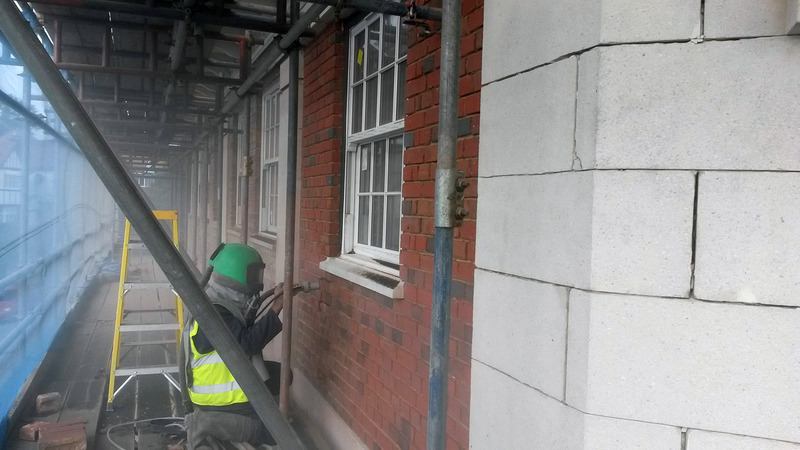 As the pressure at the surface to be cleaned is low, you can rest assured that the method will not damage the facade. It can even used for cleaning polished stones without affecting its natural shine and beauty.